With small businesses operating in cities throughout the country, every small business owner is looking for that one piece of marketing that is going to put them above their competitors. There’s a reason that when you drive down any commercial street in North America that one will find multiple LED signs along the way. Custom-made LED signs can increase your small business value and, in the minds of those driving by, will put you on the same playing field as your larger competitors. LED signs have become a mainstay in promoting businesses, large and small, for the past fifty years. Their effectiveness in real time advertising goes unmatched by any other marketing method employed today. The impact that a custom-made sign for your business can have is one that will attract customers the moment they make eye contact with your sign. No one wants to hide their business from the public. With a professional LED sign, it puts you out there for all interested parties to see. Its effectiveness is undisputable and it’s among the least expensive forms of advertising for any small business to take on. Through utilizing a custom-made LED sign, you’ll be thanking your lucky stars left and right for having made the investment. For many, this will be the first exposure they have to your business. It makes your business instantly recognizable to prospective clientele as they pass by and acts as a visual handshake of sorts with anyone willing to take it. No matter what kind of small business you own – if customers can’t find your business then you’re out of luck. The easier you make it for the customer, the more likely you will be able to close them for a sale. Commonly, small business owners have to give up their businesses because of a lack of exposure. It happens every day in nearly every product or service market. With a custom-made LED sign, you have a unique advertisement for your business out there twenty-four hours a day and seven days a week, ready to attract new customers. Maybe your business is doing well and you don’t feel like there’s a need right now to put up a sign – unfortunately, it’s this manner of satisfied thinking that kills small businesses. You may be making $10,000 in profit every week but wouldn’t you rather be making $20,000 a week or $30,000 a week? Why are you satisfied with just a tiny piece of the pie? Why not go for something bigger? With an LED sign, you’re putting up an investment to continue building your business and to keep your name out there with your competitors. The ways of marketing change every decade. Newspaper ads used to be a way to reach out to folks throughout your area to alert them of new promotions and new products or services. Unfortunately, the number of newspaper readers have been dwindling for years now. Radio advertisements used to be common but there’s no one listening to the radio anymore. T.V. commercials are extremely expensive, and there are less and less people watching T.V. every day. With a custom-made LED sign, you’re increasing the value of your small business by investing in a proven marketing strategy that will remain far into the future. The game and the competition of being in the business world is that you’re up against everyone else vying for the affections of customers who put their money towards your product or service thus allowing you to turn a profit. Utilizing LED signs in the land of small business puts your name up against the biggest competitors in your market and for an affordable price. They’re not expensive. It’s a one-time investment for a marketing technology that will serve you well for years. 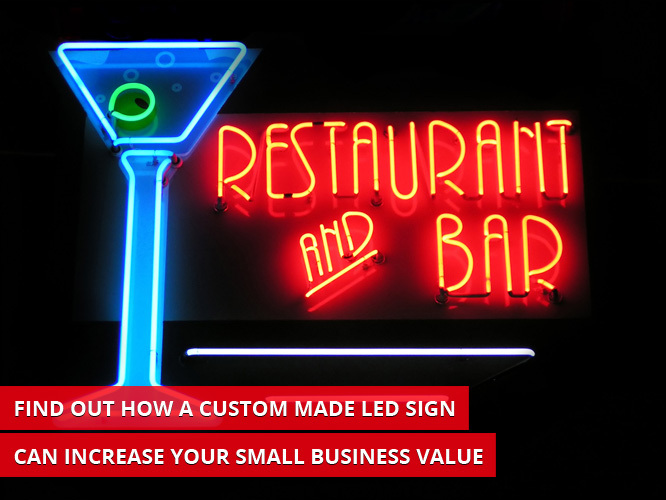 These are just a few of the reasons for why custom-made LED signs add a significant amount of value to your small business. It’s an easy way to compete with bigger competitors who are taking business away from you just on brand name recognition alone. A visual LED sign custom-made to fit your business begins building your brand in the mind of the consumer and it does so 24 hours a day, 7 days a week. Every time they see that sign, they’re going to think of your business. You’ll find yourself with more business than you would have without it. That’s a guarantee.